Mrs. Harry L. Bradley standing standing her “Girl in a Straw Hat” on exhibition in “Pierre Bonnard” exhibition at The Museum of Modern Art, New York, October 7-November 29, 1964. This year the Milwaukee Art Museum celebrates the fortieth anniversary of the Mrs. Harry L. Bradley Collection. Upon its donation in 1975, the collection elevated the status of the Milwaukee Art Museum from a local art museum to a museum with a world-class collection. The collection contains an assortment of European and American paintings, prints, watercolors, and sculptures from the late nineteenth century to the early 1970s, including works by Braque, Picasso, and Kandinsky, to name a few. During my time at the Museum I had the chance to attend a Member lecture with Barbara Brown Lee, a longtime educator at the Museum and personal friend of Mrs. Bradley, to learn more about the collection and the woman behind it. Margaret (Peg to her friends) Bradley was a Milwaukee native. She was married to Harry Lynde Bradley and the couple had one child, Jane. Mrs. Bradley was known locally for her philanthropy, and her popular dress shop, Zita’s. 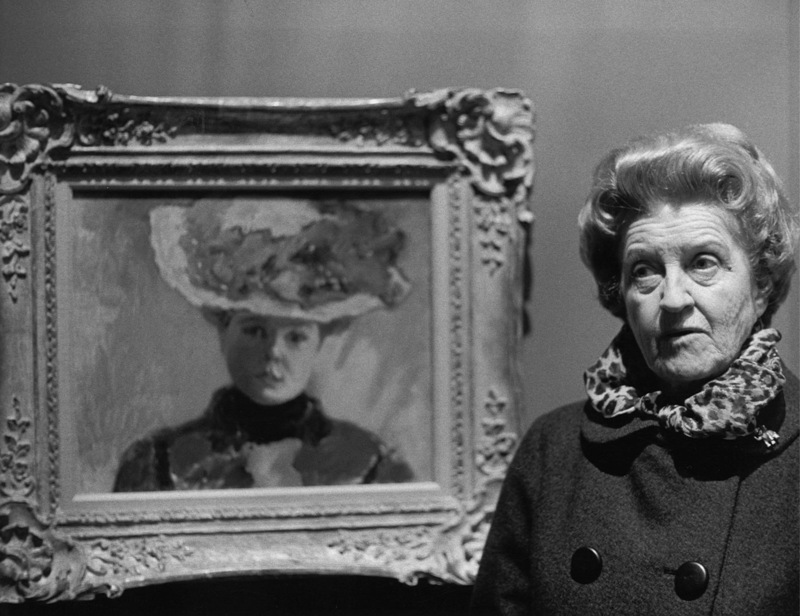 Nationally, Mrs. Bradley also was well known for her art collection. Several museums courted Mrs. Bradley and asked her to be on their boards, hoping to secure her collection as a donation one day. The Bradleys felt strongly about giving back to Milwaukee and wanted to share their collection with the community. In 1975, construction of the Bradley Wing at the Milwaukee Art Museum began. This wing would exclusively feature Mrs. Bradley’s vast collection of works by O’Keeffe and Picasso. Two pieces from the collection specifically stand out to me as remarkable. The first is an oil on canvas painting by Marc Chagall titled The Horseman. The message behind this painting is all about love. If you look closely you can see that the horseman’s body and the head of the horse form the shape of a heart. The images that surround the horseman and his horse are mythological lovers, flowers, a fiddler, and a mother with children. These figures suggest themes of love, courtship, and family in a Jewish community that is threatened by the burning houses in the background, a reference to the history of Jewish persecution. 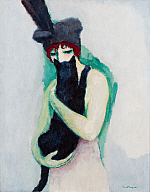 The second piece that stood out to me within the Bradley Collection is Woman with Cat by Kees van Dongen. This painting of a woman cradling a black cat focuses on the contrasts between green and red, and between black and white. Because of the use of positives and negatives in this painting, the cat can be hard for some people to identify and often is mistaken for a long beard. I particularly like this painting because of the colors and how they stand out against the white oil background. The highlighting tricks van Dongen uses around the woman’s body help capture her figure and draw your eye to the woman. The contrast of black and white throughout the painting and the woman’s red hair really make this painting stand out. Although these two great works are being stored while the Museum undergoes a major renovation, these and other paintings, including works from Pablo Picasso and Gabriele Münter, will be on view in the second-level Bradley Galleries once the renovation is complete in November. This entry was posted in Art and tagged 20th century art, Bradley Collection, Collection, European art, Kees van Dongen, Marc Chagall. Bookmark the permalink. 2 Responses to Bradley Collection Celebrates 40th Anniversary!